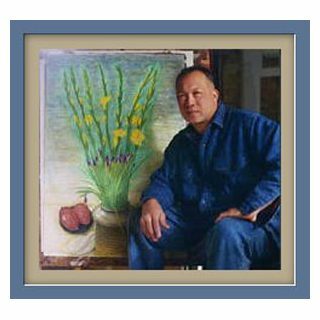 Wong Shue was born in 1952 on the Caribbean island of Jamaica in the West Indies when the island was still a British Colony. His father sent him to Canton when he was fourteen to study drawing under the master artist Alfred Chin. He later studies in Kingston, Jamaica, and Los Angeles. He has exhibited in major galleries throughout the United States as well as in Jamaica, Korea, India and France. He believes that "The artist creates the art, and the art creates the artist." This philosophy has always allowed Wong Shue to approach the creation of his artwork with complete freedom from conventional restraints. This along with the combining of several mediums at once achieves a look that is both timeless and contemporary. Venturing out from his normal intricate paintings on Japanese natsume and Chines rice paper, his work over the recent decades has been on a wider scale and consists of a much larger variety of media. 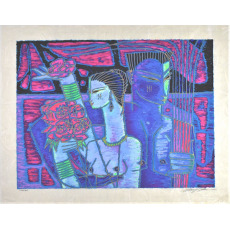 Among these there are drawings in pastels, charcoal, ink and pencil, along with woodcuts and etchings. His paintings consist of oil on canvas, gouache, acrylic, and watercolor. Adrian Wong Shue currently works from his studio in Los Angeles, California.